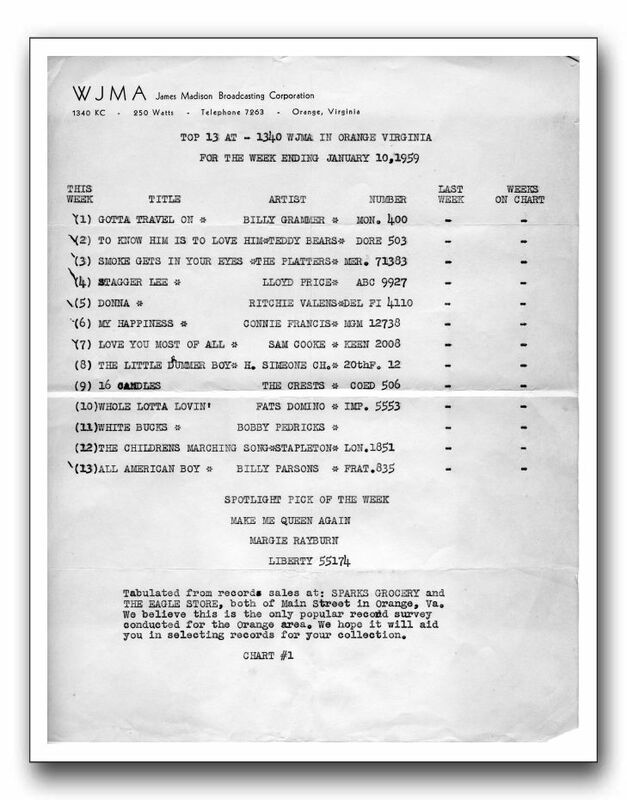 This is WJMA music chart #1 for the week of January 10, 1959. It was created by Jack Du Long who had come to work at WJMA in November of 1958. Each week Jack would visit Sparks Grocery and Eagle Store on Main Street to see what records were selling. Songs on this chart were featured on Teen Time weekday afternoons from 4:05 to 4:30. From 4:30 to 5 it was The Orange and Blue Review hosted by students from Orange County High School. Saturday mornings from 8:05 to 8:30 Record Review featured teens who gave their "candid opinions of the new record releases". Jack saved thirteen music charts from January 10 to April 4 of 1959.